Just got these Moda fabrics at American Quilting in Orem, Utah. As if I needed more Christmas-themed fabric but, as usual, I cannot resist these my favorite colors. I am working on a fall quilt which is only missing a little bit more of applique - the pieces are all there except for the matching threads. Will have to order more Aurifil 28 wt and 12 wt via Follow that Thread. Gorgeous set or what? The book is called Here Comes Winter - Quilted Projects to Warm your Home by Jeanne Large and Shelley Wicks. What wonderful designs they have come up with! Both authors learned to sew early in life with their grandmothers and aunts, their experience reflected in each project. The book features bed-size quilts, lap quilts, wall hangings large and small, pillows... great ideas for Christmas gifts. 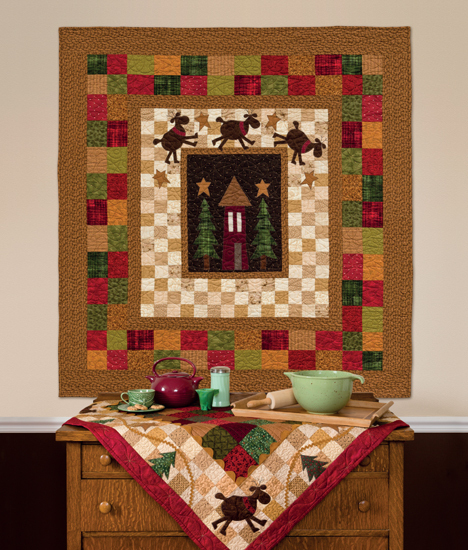 The applique pieces are whimsical and add charm to these warm-colored projects. I love their instructions for framing projects. 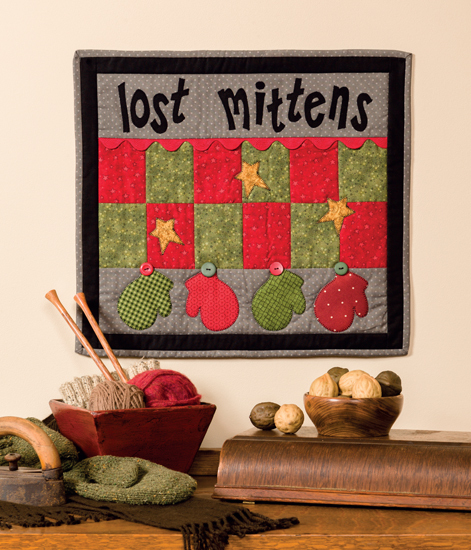 They will come in handy when I make smaller quilts, such as the "Lost Mittens" shown below. Yes, it is good to begin on Christmas presents. The one thing I don't like about the holiday is the rushing. Love the mittens and stars quilt. Thanks for the possibilities, Denise.